We first met him thirteen years ago, when he was about a year old. He and his brother and sister were rescued from a kill-shelter by a pair of ladies in our church choir, who were then informed that one more animal in the house meant one less husband, so they brought them to choir practice to try to find them homes. As soon as she saw the cats, my mom turned to me and said, very firmly, “NO.” I could play, but we were not- she repeated NOT- bringing an animal home. All three cats were beautiful and friendly, but I fell in love with the striped one, and I played with him all through practice. When it was time to go, Mom told me to put him back in the box. This cat snuggled deeper into my arms, ever-so-gently put his paw against my cheek, turned to look at my mother, and started purring. I didn’t catch the first few words my mother muttered, probably because she didn’t want to swear in church, but the last word was opportunist, and he came home with us. I’m still not sure how it was that my brother got to name MY cat. I wanted to name him McGonagall, because when he was younger (before he reached Jabba the Hutt proportions) he lacked only the square markings around the eyes to look just like Professor McGonagall’s animagus in the first Harry Potter movie. And yet, somehow, he got the name Aristotle, and I had to be content with giving him McGonagall as a middle name. Aristotle McGonagall Hutchison. Over the years, he acquired a wide variety of nicknames: Stotle, Corky, Herpes (which, somehow, isn’t as gross as it sounds- in cats, the herpes virus is a respiratory infection that acts rather like a cold, and is responsible for chronic sneezing). As he got older and fatter, unable to lose weight due to metabolic damage from bladder crystals, he grew (and grew!) into Fat Cat, Meatball, Walrus, Sea Lion, and Seal Pup. Being a cat, of course, he alternated between answering to all of these plus anything else that came to mind, or answering to none of them. Aristotle was a mellow guy. He loved to play, of course, but it was pretty hard to truly bother him. He didn’t growl, he didn’t claw or bite. Well, not without direction provocation. In thirteen years, the only time he ever bit me was when I was holding him still against my chest so my brother could scour his infected claw beds. He played with our dog, Cinnamon, who was the same size he was- and significantly lighter. He wrestled with my brother’s cat when we lived together, and when we had a third roommate with a cat that thought SHE was queen of the castle, Stotle only put up with it for so long before he rolled over and smacked her across the face. After that all he had to do was roll over or lift a paw, and that cat would streak away and stop bullying them for a while. He was a hunter though, when he was still an outdoor cat. We lived in a house with a dog door that I think Stotle used more than Cinnamon, and he’d bring us tokens of love from his endeavours. Lizards, usually. Most of the time they were even dead. But sometimes there were birds, or mice. One morning I woke up to a scream, rushed out to the hall, and there on the inside of the dog door, neatly laid out on the rug leading into the kitchen, was a dead squirrel that my mother had nearly stepped on as she made her way to coffee. -by reminding me of the importance of taking frequent breaks. 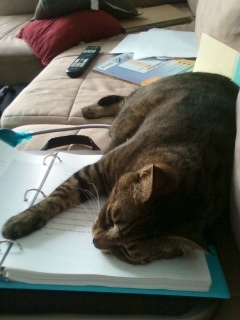 It never really mattered what I was working on, he was there to sprawl across it. I think the biggest conundrum of his every day life was trying to figure out how he could lay across All The Things simultaneously. Internet laptop, writing laptop, various notebooks or clipboards or binders. Just a week and a half ago, I had three binders, two magazines, and my nook spread out across the bed as I was working on something, and he kept shifting position trying to get at least a paw on all of them. In the picture above, he was helping me with my first round of edits with Editor Andrew, on what became A Wounded Name. Lately, his favorite spot to sit, when he’s not sitting on top of me or my projects, is the box of author copies. I have over a dozen boxes of books scattered around the room right now, while I’ve been camped out at my mom’s, but he always goes for that one, even if there are things on that one and none on the one next to it. Always the one with the author copies. I even did an experiment where I moved that box across the room and put another in its place- he still went for the one with my book in it. Eight days ago, Stotle was diagnosed with newly-transitioned diabetes. As a diagnosis, it wasn’t really a shock. Given the long-term damage from his way-too-close near-death experience with the bladder crystals nine years ago, diabetes was pretty much an inevitability, and we were prepared for that piece. We’d caught it extremely early in the transition, and the vet was very optimistic that we’d get this regulated quickly and he’d be fine, just needing twice-daily insulin injections. Except…a couple of days later he crashed and crashed hard into what’s called DKA. Basically, it’s the step below diabetic coma. He required hospitalization to try to get his glucose levels under control, as well as get hum rehydrated. In three days he’d lost over two pounds, most of that purely from dehydration because he had no appetite or thirst. We shuffled him between the vet’s day hospital and the emergency vet’s night care, and in addition to his glucose and proteins being out of whack, his electrolytes were badly upset by both the dehydration and the insulin. But after days of intense care, he wasn’t stabilizing. He was calm with me but feisty with everyone else. The emergency vet has a policy of no personal effects with the pets, but they let me bring his bed from home to see if that could reduce the stress a bit. He barely touches the bed when he’s home, but he stayed in it all Friday night. The reduction in stress didn’t really help, though, except to make him more comfortable. His glucose levels were still too high and his electrolytes were too low, despite insulin every four hours and a constant drip of enriched fluids. The emergency vet was willing to tell us what his regular vet wasn’t: at most, Aristotle had a year left, but the chances were high (like 90%) that IF he came out of DKA this time, which was not only not guaranteed but at this point not very likely, he would definitely crash into it again. When they brought him into the exam room for us to see, we could hear his wheezing from across the room. He’s an enormously fat cat, so he’s wheezed for years, but only ever when he was on his back or side. Now he was wheezing when he was sitting or laying normally, indicative of early congestive heart failure. He wasn’t going to get better, and he wasn’t going to be comfortable. The decision to let him go was the hardest I’ve ever made in my life. I knew Friday evening that it was something I needed to seriously consider, but at first all I could do was sit there and sob. Thirteen years Aristotle has been part of our family. He’s the reason we know that you can return a ladder to Home Depot if the only thing you use it for is to get a cat out of a tree. 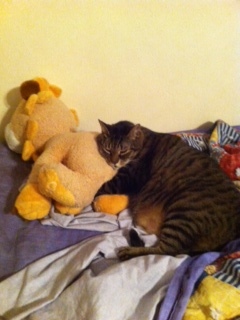 He’s the reason my poor penguin Pillow Pet looks disfigured, because Aristotle decided that was HIS penguin. He’s the reason I know cats actually pay attention to what people are doing in the bathroom- ten years ago, I kept forgetting to change his litter box, so he’d piss in the toilet and then paw at the handle to try to flush it. Aristotle has been with me through four houses, six apartments, and eleven moves. We drove all the way to Colorado and back, and he hates seeing what’s outside the car when he travels, so he chilled all day in a laundry basket covered with a towel, and then explored the hotel rooms at night. He never minded when I was having a bad day and cried all over him as we snuggled, and he LOVED to cuddle up to my best friend whenever she came to visit, even knowing she was just going to shove him off the bed. Honestly, I think that was his favorite part, trying to see how long he could be there before she noticed him and pushed him away. (she’s allergic to cats, by the way, not being hateful). I always had to do the Stingray Shuffle on the way to the bathroom at night because I never knew if he was going to be sleeping right where I needed to put my feet. He’d pounce on your shoes as soon as you took them off, wrapping himself around them and shoving his whole head inside, the stinkier the better. And when he was upset, if there’d been a sudden bang or a knock on the door, if something was stressing him out if we were at the vet’s, he’d curl up close and bury his head down my shirt. So here’s to Aristotle. I’m grateful for his love and companionship, for his playfulness, his mellowness, I’m grateful for the joy he brought me and the comfort he gave me. Letting him go was the hardest thing I’ve ever done, but he died loved, he died calm and comfortable, not in pain and panic and fear, and he fell asleep in my arms.